Perhaps the most intriguing and picturesque landscape in all of Germany’s wine country lies at the peaceful banks of the Mosel – a river which twists and turns in narrow loops through countryside where the Celts and Romans first cultivated wine around 2,000 years ago. 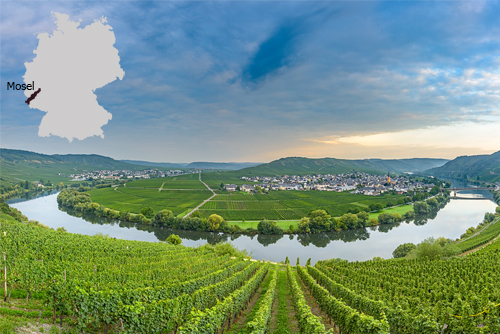 As a wine region, Mosel is the oldest in Germany and the largest with vines on steep slopes. Along with Rheingau, Mosel is arguably Germany’s best known wine-producing region and revered as one of the best Riesling regions in the world. The slopes where Mosel wines are grown were once sea beds, beaches and coastal mudflats. Thin topsoil over slate and shale force roots deep into the ground in their search for nutrients, producing wines which rank amongst the finest white wines in the world with their wonderful mineral notes.